Since October 2012, Christian A. Andreach is the fund’s manager. Andreach is a Managing Director of the Consumer Group at Manning & Napier and the Co-Head of Global Equities. This top balanced fund also has a dividend yield of 1.73% for the past 12 month. The annual holdings turnover rate is 25% which is lower than the average of 60.11%. This best fund has an expense ratio of 0.89%. There is no sales load and 12b1 fee. Investor can buy this top balanced mutual fund with $2,000 minimum initial investment. This EXDAX fund is offered by 85 brokerages such as E Trade Financial, Schwab, Dreyfus, RBC Wealth Management, Ameritas, etc. For tax deferred account such as IRA or 401k, please check with your administrator. This fund also offered in three different classes such as Class R (MNCRX), Class C (MNCCX), Class I (MNCIX). 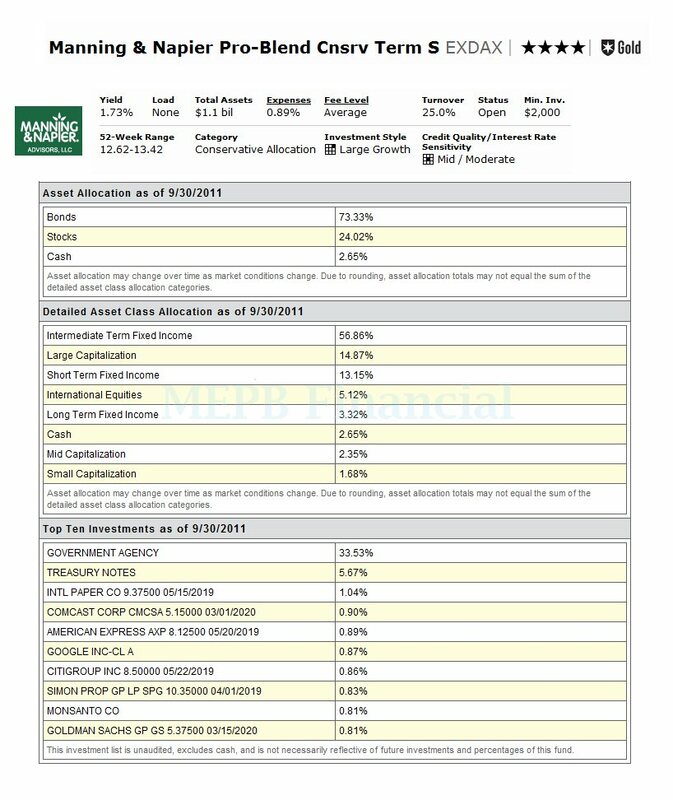 For 2011, this conservative allocation fund has returned 2.57%. Morningstar has rated this fund with 4 star rating. It also is given gold rating for forward looking performance. This best balanced fund has returned 7.55% over the past 3 year, 4.69% over the past 5 year, and 5.38% over the past decade. Per the fund’s prospectus, the investment risks include issuer specific risk, stock market risk, foreign investment risk, and small-cap/mid-cap risk. 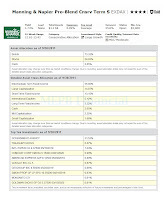 As of October 2011, the fund’s assets are allocated as follows: 73.33% in bonds, 24.02% in stocks, and 2.65% in Cash. The top 8 classes in this fund are: Intermediate Term Fixed Income (56.86%), Large Capitalization (14.87%), Short Term Fixed Income (13.15%), International Equities (5.12%), Long Term Fixed Income (3.32%), Cash (2.65%), Mid Capitalization (2.35%), and Small Capitalization. The top 10 investments are: Government Agency, Treasury Notes, International Paper Co bond, Comcast Corp bond, American Express bond, Google Inc CL A, Citigroup Inc bond, Simon Properties bond, Monsanto Co, and Goldman Sach bond. Note: There are 4 type of balanced funds such as conservative allocation, moderate allocation, aggressive allocation, and world allocation.